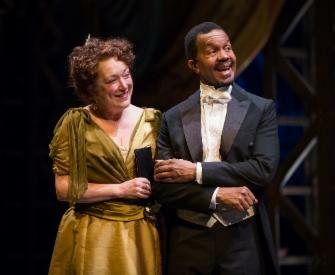 Goodman Theatre presents THE MATCHMAKER. Full disclosure: “Hello Dolly” starring Barbara Streisand is one of my favorite movies. I’ve easily seen it over two dozen times. I know the banter, the punchlines and all the songs. My love affair with the musical movie made me giddy for this origin play. My expectations were high before the curtain rose! And the show in every way exceeded my expectations. Playwright Thornton Wilder premiered this play in 1955. It’s a story about people stuck in their lives. They work. They eat. They sleep. They yearn. They all long for an adventure. And on the same magical day, they each throw 1896’s convention to the wind. They kick their heels up and try to find love in New York City. Wilder pens a comedic romp. His characters are exaggerated to absurdity. The set-ups are wildly convenient. Interactions often end with a punchline or a cheeky wink. This farce is funny and charming. Wilder keeps it from being schmaltzy with earnest soliloquies. His characters regularly speak directly to the audience with vulnerable honesty. While the heartfelt disclosures add depth to the play, Director Henry Wishcamper adds the breadth. Wishcamper casts a very culturally diverse ensemble. At first, it’s noticeable. 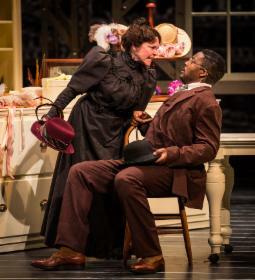 Allen Gilmore (an African-American actor playing Horace) berates his niece Theo Allyn (a caucasian actor playing Ermengarde) for loving Ronobir Lahiri ( an Indian-American actor playing Ambrose). Wishcamper layers in his own subtle humor because the opposition isn’t based on the interracial relationship. Gilmore disapproves because Lahiri is an artist. The 1955 premiere was a predominantly white cast at least in the principal roles. Wishcamper’s matchmaking makes all the pairings interracial. This contemporary twist literally adds color to this amusing frolic. Wishcamper also uses music in his storytelling. It’s not the big blockbuster numbers from the “Hello Dolly” musical. Instead, Wishcamper stages pop-up bursts of unexpected musical interludes during scene transitions. The most memorably quirky is produced by Ron Rains on the saw and Allyn on the trumpet. Wishcamper also incorporates singing and dancing often led by the spitifire Elizabeth Ledo (Irene). Ledo plays a widow with moments of heartbreaking transformation. Although Ledo is clad in her black mourning dress, we see her shed her blanket of grief onstage. Choosing to live to the fullest, Ledo spearheads much of the shenanigans. At one point during a waltz, we see her falter as if deciding whether to return to her safer existence. Sydney Germaine (Minnie) swoops in and sweeps Ledo off her feet and back on the path to unknown adventure. The entire ensemble is wonderful. In the lead, Kristen Nielsen’s (Dolly) vitality is infectious. She brings a whole lot of personality on-to-the-stage. She is a perfect match for Gilmore, the deadpan curmudgeon. Their scene at the Harmonia Gardens restaurant is you-go-your-way-I’ll-go-mine hysterical. Postell Pringle (Cornelius), best known to me for his high energy performances with The Q Bros, delivers in unrecognizable performance as the sweet bumbling head clerk. And nod out to Behzad Dabu (Barnaby) for bringing impressive physicality to his slapstick. For me, Act 1 and Act 2 mirrored almost exactly “Hello Dolly.” I knew the dialogue and jokes well enough to understudy any role. I realized some of Thornton’s soliloquies were even made into lyrics for songs. Thornton’s Act 3 and Act 4 are quite different from the musical. In particular, Act 4 introduces a new character, Flora Van Huysen (played by the superb Marilyn Dodds Frank). Through coercion or mistaken identities, everyone ends up in Miss Van Huysen’s parlor. An overly dramatic Frank provides asylum for lovers. Thornton’s wacky character is perfect for Frank’s comedic timing. An eccentric Frank brings the lampoon to a satisfying and riotous finish. THE MATCHMAKER produces a union I loved. Thornton even ends with a moral of the story. He encourages people to seek out new adventures. What’s not to love about that? I highly recommend this play for light-hearted romantic fools like me.